Just like cold somen noodles, Hiyashi Chuka (Chinese-style cold noodles with toppings) is one of our regular dishes at home during the summer. This summer, somehow I decided to smoke the ingredients with my donabe somker, "Ibushi Gin" for hiyashi chuka one day, and it became an instant huge hit. 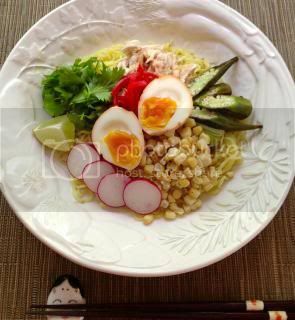 Since then, this smoked hiyashi chuka has become our mainstream. 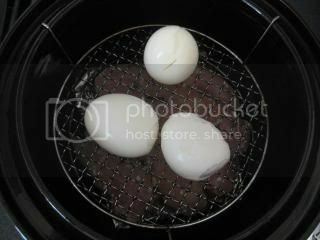 The process is extremely simple with the donabe smoker, "Ibushi Gin". 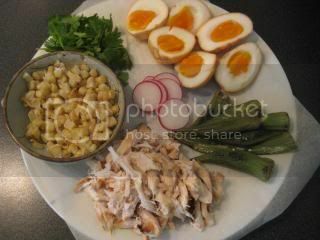 Once the smoke chips were set in the bottom of the donabe, ingredients were set, in order of chicken tender, soft boiled eggs, and grilled vegetables from the bottom. 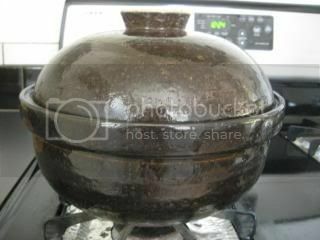 Donabe was set over high heat. Once the smoke starts to come out, I covered it with the lid, and smoked for 5 minutes over high heat. The heat was turned off and the donabe was let rest for 15 minutes (meanwhile, the ingredients were continued to be smoked and cooked with carry over heat and smoke inside). The ingredients were perfectly smoked and so aromatic. Chicken tender was really tender, and soft boiled eggs kept the soft egg yolk, while the outside absorbed a lot of smokiness. 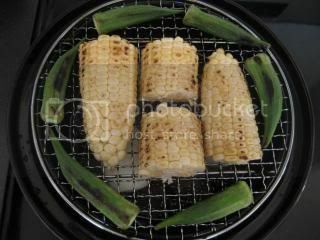 Grilled corn and okra were nicely smokey, too. I got ready the ingredients, along with my killer yuzu-soy sauce for the noodles. With additional sliced radish, cilantro, and pickled ginger, my smoked hiyashi chuka was ready. 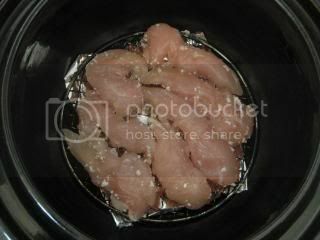 Marinate the chicken in shio-koji for a few hours (or at least 30 minutes). Gently wipe off the marinade with paper towel. Set aside. 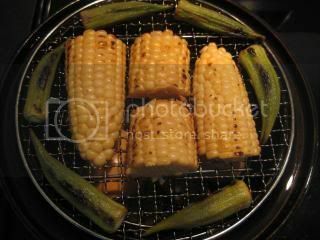 Grill the corn and okra until they are barely cooked. Split the corn cub in half by knife. Set aside. Boil the eggs until just done. Peel and pat dry with paper towel. Set aside. In a bowl, whisk together the ingredients for the sauce. Set aside. Line the bottom of “Ibushi Gin” with a piece of aluminum foil. Spread the smoke chips so that they make a ring shape. Make sure the foil is tightly attached to the bottom. Set the ingredients on the racks in "Ibushi Gin" in the order of the chicken tender (bottom rack), eggs (middle rack), and corn and okra (top rack). Set “Ibushi Gin” (with no lid) over high heat. Wait until the chips starts smoking (about 7-8 minutes). Cover with lid and pour water into the rim surrounding the lid. Continue to heat for 5 minutes. Shred the chicken by hand. Cut the eggs in half. Also cut the okra in half at an angle. Cut the corn kernels from the cob. Set aside. Cook the noodles according to the package's instructions. Rinse in cold water and drain well. Divide the noodles into two bowls. 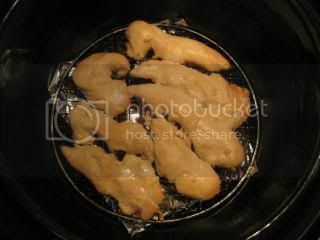 For each, drizzle 1 teaspoon sesame oil and sprinkle 1 teaspoon sesame seeds and toss. Decorate the noodles with all the smoked ingredients, lime, radish, cilantro, and pickled ginger. Pour about 1/4 cup (60 ml) of the sauce over each bowl and serve. 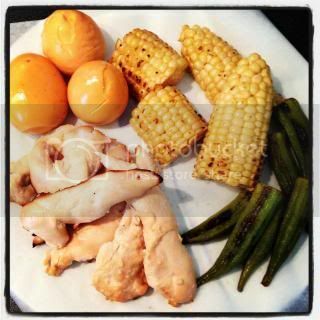 You can also find the recipe on toiro kitchen's website.